Among other things of interest, the Geoinformatics Laboratory is engaged in using the old maps and their potential for landscape studies. One of the first steps was the Project of Science and Research assigned by the Ministry of Environment (see also http://projekty.geolab.cz). As a primary goal of this project the copies of the Ist and IInd Military Survey were obtained (from the Austrian State Archive/Military Archive in Vienna, where the originals are kept) and displayed in digital form on these pages. After the agreement with the Historical Institute of the Czech Academy of Science, we created the online presentation of the Müller's Survey covering the area of Czechia and Moravia. Work on the Stabile Cadaster Online application is in progress, the first version see here. 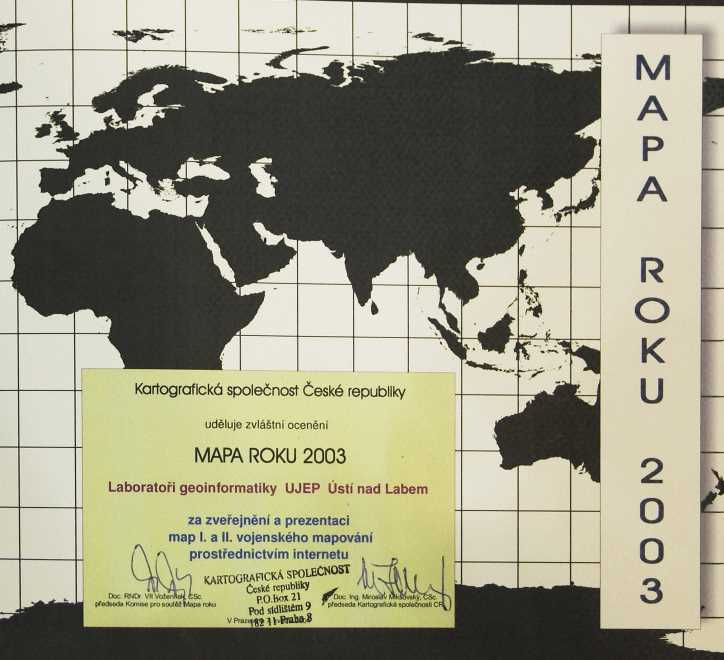 The OLDMAPS.GEOLAB.CZ application was awarded by a special prize MAP OF THE YEAR 2003 of the Cartographic Society of Czech Republic.